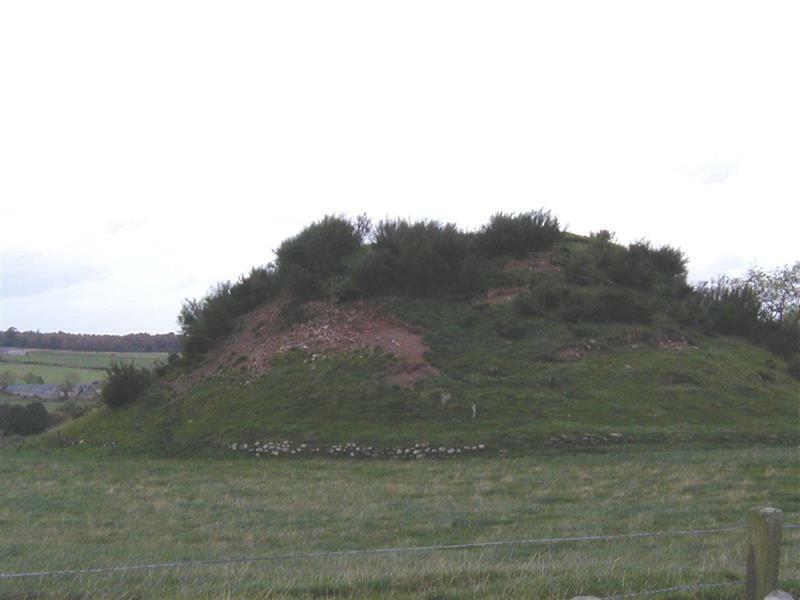 An artificial mound of clay, some 60 to 70ft high and about 200 yards in circumference at base (17 yards circumference on top). It is surrounded on three sides by a low stone wall, and on E by the Burn of Cantraydoune. Name Book 1870. 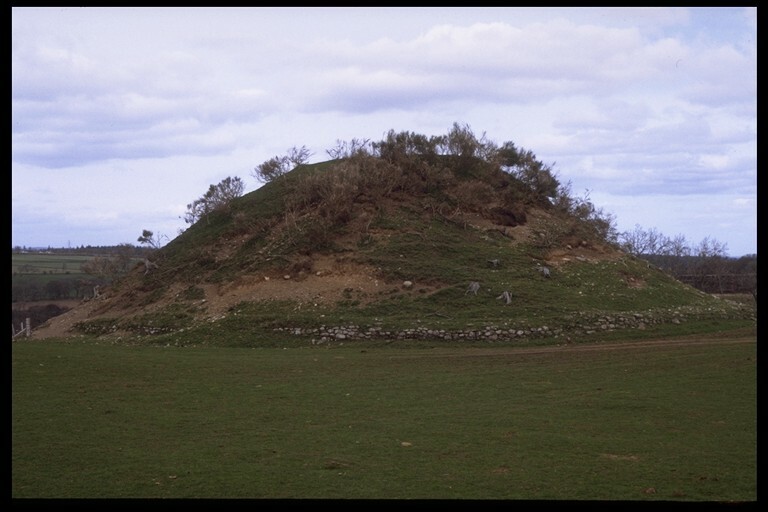 A large earthen mound about 16m high, surrounded by a partially ruined retaining wall, maximum height 1.2m, which is of latter date. Mr Meldrum considers it to be a motte. 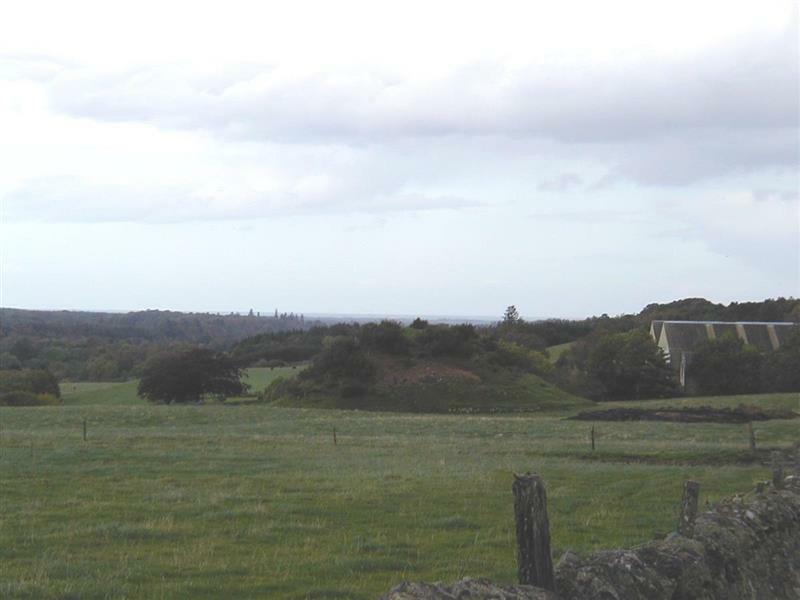 (Mr E Meldrum, County Architect's office, Inverness) Earthworks surveyed at 1:2500. Visited by OS (N K B) 14 August 1964. 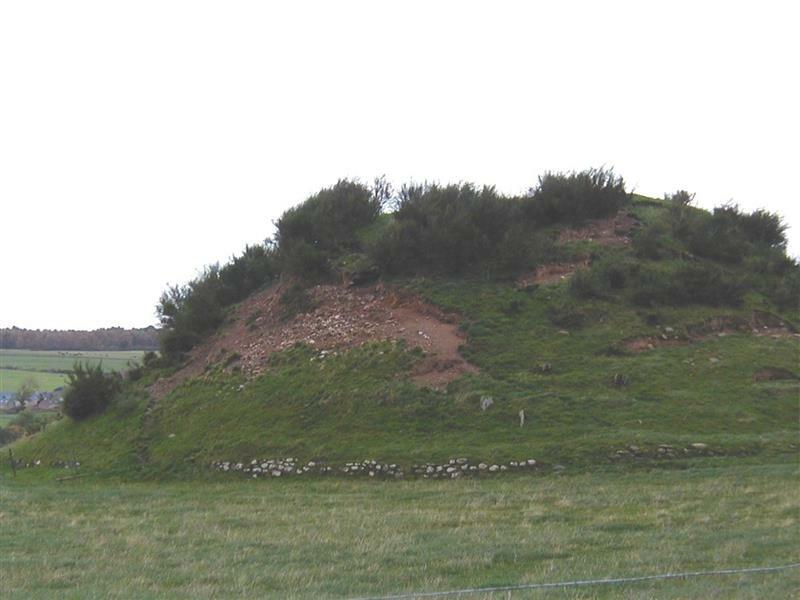 This sandy mound, which rises about 16m above the face of the natural slope, is probably a motte. No features are visible on the uneven summit or on the flattened area that projects from the N side. A deep groove in the E side may be an old excavation trench. The mound, which has been cleared of trees, is now grass-covered and surrounded by an enclousure wall, apparently of no great age. RCAHMS 1978; ISSFC 1885; G G Simpson and B Webster 1972. Highland Council Archaeology Unit, HCAU Slide Collection Sheet 7, 137-8,142 (Image/Photograph(s)). SHG24258. Motte, Cantrydoune, Strathnairn. (Image/Photograph(s)). SHG14211. Name Book (County), Object Name Books of the Ordnance Survey, Book No. 5, 3 (Text/Publication/Volume). SHG3382. ISSFC, 1885, 'Excursions to Strathnairn', Trans Inverness Sci Soc Fld Club Vol. 1 1875-80, p.27-36, 30 (Text/Publication/Article). SHG779. Simpson and Webster, G G and B, 1972, 'Charter evidence and the distribution of mottes in Scotland', Chateau Gaillard Vol. 5 1972, p.175-92, 183, No. 186 (Text/Publication/Article). SHG427. RCAHMS, 1978, The Royal Commission on the Ancient and Historical Monuments of Scotland. The archaeological sites and monuments of Nairn District, Highland Region, 18, No. 130 (Text/Report). SHG2672. Yeoman, P A, 1988, 'Mottes in Northeast Scotland', Scot Archaeol Rev Vol. 5 1988, p.125-33, 131, no. 75 (Text/Publication/Article). SHG1131. --- Text/Publication/Article: Yeoman, P A. 1988. 'Mottes in Northeast Scotland', Scot Archaeol Rev Vol. 5 1988, p.125-33. Scot Archaeol Rev. 125-33. 131, no. 75. 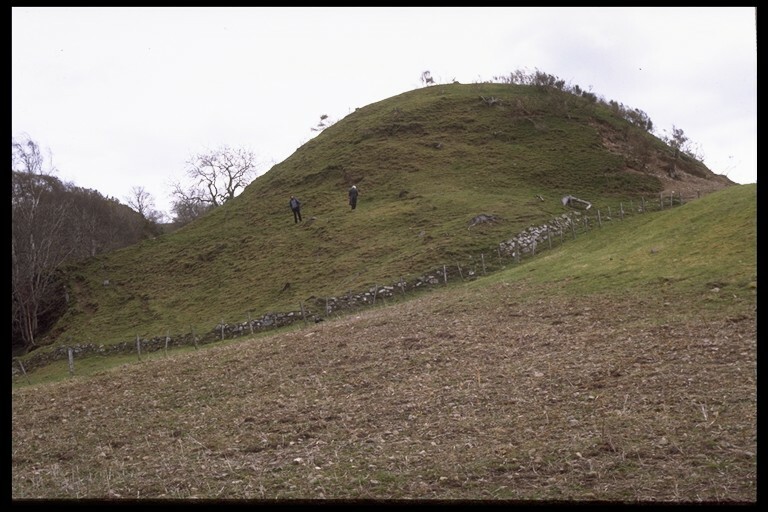 --- Image/Photograph(s): Motte, Cantraydoune.. Colour Slide; Digital Image. .
--- Image/Photograph(s): Motte, Cantrydoune, Strathnairn.. Colour Slide; Digital Image. .
--- Image/Photograph(s): Highland Council Archaeology Unit. HCAU Slide Collection Sheet 7. Colour slide. . Digital (scanned). 137-8,142. --- Text/Report: RCAHMS. 1978. The Royal Commission on the Ancient and Historical Monuments of Scotland. The archaeological sites and monuments of Nairn District, Highland Region. . 18, No. 130. --- Text/Publication/Volume: Name Book (County). Object Name Books of the Ordnance Survey. Book No. 5, 3. --- Text/Publication/Article: Simpson and Webster, G G and B. 1972. 'Charter evidence and the distribution of mottes in Scotland', Chateau Gaillard Vol. 5 1972, p.175-92. Chateau Gaillard. 175-92. 183, No. 186. --- Text/Publication/Article: ISSFC. 1885. 'Excursions to Strathnairn', Trans Inverness Sci Soc Fld Club Vol. 1 1875-80, p.27-36. Trans Inverness Sci Soc Fld Club. 27-36. 30.